The number of cases of children with vitamin D deficiency, even including cases of rickets, is increasing the world over. Many health organizations have released new guidelines on Vitamin D for children and recommend that supplements are taken.  Live in countries with too little sun.  Remain indoors too much, or cover up with clothes, or veils, which significantly reduces Vitamin D production.  Black skin absorbs vitamin D less effectively than white.  Don't get adequate Vitamin D from diet alone - so there are new recommendations that everyone should take a Vitamin D supplement. Vitamin D is crucial to health across all population groups. Recently the Scientific Advisory Committee on Nutrition in the UK ran a review to see exactly how crucial it was and how we, as a population, were going to meet our needs. 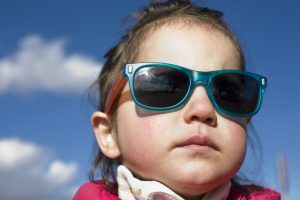 The review got a lot of publicity as it recommended that everyone over the age of 4 have a daily supplement of 10μg (400IU) per day of vitamin D. However, what does this mean for your child who is under the age of 4? We look further into the new guidelines and suggest what impact they might have on the vitamin D consumption of your child.  Why do we need vitamin D? Most people associate vitamin D deficiency with a disease called rickets, characterised by a bowing of the legs during childhood. As vitamin D is an essential nutrient for bone health, in addition to rickets, deficiency is also associated with increases in bone fractures, falls, and a general loss of musculoskeletal functioning. In addition to bone health, vitamin D deficiency has also been linked to some cancers, autoimmune diseases, infectious diseases and cognitive functions, however, further studies need to be carried out on these diseases.  What are the main sources of vitamin D? Sunlight is the main source of vitamin D, however, in the UK and the USA, we can only get vitamin D from the sun between the months of April to October. Additionally, covering up, using sunscreen, wearing veils, staying indoors and air pollution (all of which are on the rise) prevent our skin from absorbing the UVB rays needed to produce vitamin D.
Therefore, we then turn to diet to meet our vitamin D needs. Unfortunately, dietary sources of vitamin D are limited and to meet your full needs through diet would require copious amounts of egg and fish – very nearly impossible for the majority of the population. This leaves only the option of supplementation to meet our vitamin D needs.  How much vitamin D do we need? The new guidelines recommend that everyone aged 4 and over now has 10μg (400IU) of vitamin D per day. As current dietary intake is around 2 μg/day in younger children, around 2-2.5 μg/day in older children and 3-5 μg/day in adults, most people will require a supplement to meet this recommendation. 8.5-10 μg/d for ages 0 to 1 year (including exclusively breastfed infants). 10 μg/d for ages 1 to 4 years. Children who are still having infant formula will receive their vitamin D from the formula which must, by law, be fortified with vitamin D. On average, an intake of approximately 700ml (~25oz) per day or more will mean they meet their vitamin D needs. Once they are on less than this, a vitamin D supplement will be required to meet their needs. It was previously assumed that breastfed infants would obtain their vitamin D through mothers stores, however, this now seems unlikely and therefore exclusively breastfed infants and infants taking both breast and formula milk are recommended to take an 8.5-10 μg supplement daily. Once they are over 1 this supplementation should increase to 10μg per day and continue indefinitely. If you are pregnant or breastfeeding you can take a Vitamin D supplement to help boost your stores of Vitamin D for your breastmilk and baby too. It is worth mentioning that in the USA and Canada all infants which are exclusively breastfed or on less than 1000mL of infant formula per day should be supplemented with 10μg of vitamin D from birth. At the age of 1 requirements increase to 15μg per day, however, because dairy products are fortified with vitamin D in North America, future supplementation needs would depend on your child’s intake of dairy products and overall diet. The new guidelines mean that every infant, toddler, child, adolescent and adult (barring infants taking >700ml of infant formula per day) requires a vitamin D supplement. In children under 12 months old this is an 8.5-10 μg supplement daily and every other person requires a 10 μg supplement daily.